To finish the last edge of the project, you must bind off. Binding off can be done on either a knit or purl row, however, always bind off in the same stitch in which the row was worked, unless the directions say otherwise. This means to knit the knit stitches and purl the purl stitches. Work the first two stitches of the row. With the point of your left needle, lift up the first stitch and pull it over the second stitch and off the right needle. One stitch is bound off and there is one stitch left on the right needle. Continue to work as before until the only remaining stitch is on the right needle. Leaving a 6" tail, cut the yarn and pull the end through the stitch securely. Always bind off loosely so the last row is the same gauge as the body of the project. Cable stitches — how do you make them? A cable stitch is formed by holding some stitches on a separate needle either in front or in back of the work. The cable crossing is worked on the right side of the project and usually in a pattern of 6 or 8 stitches. For a 6-stitch pattern, for instance, slip the first 3 stitches onto a cable or double pointed needle and hold them in front of the work. Knit the next three stitches from the left needle. Then knit the three stitches from the cable needle. If this seems awkward, return the stitches to the left needle and then knit them. This creates a cable cross to the left. If the cable stitches are held in the back of the work, it creates a cable cross to the right. Often a pattern will require you to cast on additional stitches after you have started your work. This is often called Cable Cast-On. Insert the right needle into the space between the first two stitches. Wrap the yarn as you do for knitting and pull a stitch through, but do not slip any stitches off the left needle. Bring the new stitch up and slide it onto the left needle. Continue in this manner always inserting the right needle between the new stitch and the one before it. Be careful not to pull the new stitches too tightly. If possible, start a new ball or skein of yarn at the beginning of a new row because it is easier to weave in the yarn ends. Leaving approximately a 6" tail, pull a loop of the new yarn through the first loop on your needle. It's sometimes helpful to tie a loose knot, joining the old and new yarn. When the project is completed, always untie all knots and weave the yarn ends into the fabric. Similarly when changing yarn or yarn colors, always try to do it at the beginning of a row, leaving a 6" tail of both yarns. Wrap a loop of the new yarn around the right needle and continue knitting. After a few stitches tighten the tails and tie a lose knot to prevent holes. Later untie the knots and weave in the ends on the wrong side. Use the same methods when changing colors or yarn in the middle of a row. Leave a 6" tail of both yarns. Pick up the new color yarn from underneath the old yarn so the colors loop around each other on the wrong side to avoid holes in the work. Circular needles — how do you use them? As with straight needles, you can knit back and forth simply by turning the work at the end of a row as usual. To knit in the round, cast on as usual. Do not turn the work but knit into the first stitch cast on, which joins the work to make a tube. The first round is completed. All knit stitches will be on the outside and all purl stitches inside. Before joining the work, check carefully to see that the cast on ridge lays on the inside of the needle and never twists or rolls around. A stitch marker should be placed at the beginning of the round. Circulars are often used for finishing necklines where picking up stitches in a circle would be awkward to do with straight needles. Knitting the body of a sweater in the round eliminates side seams. The work is usually divided for front and back, working back and forth to form armholes and shape the neck. Curled edges usually result when working in the stockinette stitch (knit one row, purl one row). If the edge is going to be within a seam, it doesn't matter. To knit a simple, smooth edging on a scarf, knit the first and last four stitches. This forms an easy garter stitch border. Another way to avoid curling is to single crochet around the edges of the project, then block. Decreasing narrows the garment and the simplest way is to knit or purl two stitches together. Extra stitches — where did they come from? The beginning of a row is where knitters accidentally add most stitches. Tug on the edge of the knitting to identify the first stitch to be knitted. Be sure the yarn is behind the work for knitting and in front for purling. Accidental yarn overs will add stitches on the edge, as well as in the middle of the row. Be sure to knit in the stitch and not the bar between the stitches. Check to see if yarn in the stitches is not split. Finishing refers to seaming the garment pieces together (see Joining Seams) and weaving in yarn ends (see below). Blocking the garment evens out stitches, flattens your seams and gives the garment a more professional appearance. Follow the yarn label for the manufacturer's directions. When a yarn label says to machine wash and dry, it usually means the yarn has "memory," i.e., machine washing and drying will restore the original shape. Some yarns require different methods of blocking such as wet blocking or steaming. For wet blocking, hand wash or dampen the garment, squeezing out as much moisture as possible by wrapping in a towel or a short machine spin. With the whole garment supported, lay it on a flat surface to dry. If steaming, keep the iron or steamer at least a half inch above the garment on the wrong side. Lay the garment flat to dry thoroughly, as it can be warped or misshapen when damp. Increases enlarge a piece by adding stitches. There are many methods. A simple way is to knit in the front of a stitch as usual and back of the same stitch. 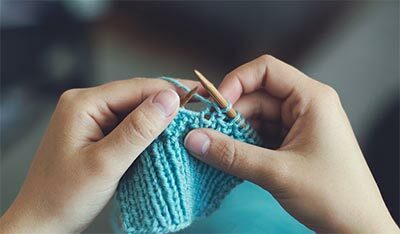 To accomplish this, knit in the front of a stitch as usual and without removing it from the left needle, insert the right needle into the back of the stitch, wrap the yarn around and draw through to the right needle. Another method is knitting between stitches, which is referred to as "Make One" and abbreviated M1. Insert the left needle under the thread between two stitches, twist and knit. Also see Yarn Over or Cable Cast On in the Casting On section. There are several ways to join seams, but whatever method you use, be sure not to pull the seaming thread too tight or the seam will pucker. The most common method of weaving seams together is invisible weaving also called mattress stitch. With right sides facing you, lay your project on a flat surface and thread a blunt-point needle with matching yarn. Beginning at the hem edge, secure yarn through both sides. With the needle pointing up, pick up the bar between the first and second stitches on one side. Leaving yarn loose, go to the opposite piece and pick up the corresponding bar. Continue working back and forth and every three or four stitches, tighten the yarn in seam. Be sure the yarn is tight enough to disappear, but not so tight as to shorten or pucker the seam. Backstitch creates a bulkier seam. Hold right sides of the garment together. With a blunt-pointed needle and matching yarn, begin at the hem edge and in the seam edge. Come up through both fabrics at point A, make a stitch backwards and come up at a point beyond where you made the first stitch. Match backstitch size with knitted stitch for stitch. Slip Stitch is another method but it also creates a bulky seam. Make a slip knot at end of the yarn. With right sides together, put hook under both bound off edges, catching the slip knot and pull through both pieces of fabric. Insert hook under the next stitches; pull through all loops on the hook. Continue until seam is complete. The stitch may be worked under all loops, two innermost or two outside loops of both pieces. Overcast is another method, but also creates a bulkier seam. Again with blunt-pointed needle and matching yarn, place right sides together and insert needle back to front, bringing the needle over the edge. Insert needle back to front again catching only one or two strands from each edge. Continue in this manner. Missing stitches … where did they go? 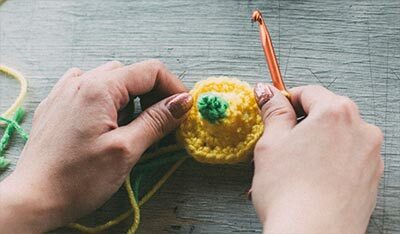 If the dropped stitch is only a few rows back, pick it up with a crochet hook, pulling the bar between stitches on either side through the lost loop. Determine if the dropped stitch is a knit or purl stitch so that it will look like the other stitches in the row. If it is a knit stitch, insert the crochet hook through the dropped loop from front to back hooking onto the bar and pulling it through the loop. If it is a purl stitch, insert the crochet hook into the dropped loop from the back to the front. Continue picking up the bars until loops are made in all the dropped bars. If the dropped stitch is more than two inches in rows back, it is best to unravel the knitting to the error (See Ripping Out). If the mistake is only one or two rows below, you could "tink" — that's "knit" spelled backwards; unknit the row one stitch at a time. Insert the left needle securely into the stitch (front to back) below the loop on the right needle, slip the loop off the right needle, and then carefully pull the yarn so the loop is undone. Inserting the left needle first avoids dropping splitting and dropping a stitch and prevents a "run' all the way down. "Tinking" is tedious so take your time and when you reach the mistake, see what caused it so you don't do the same thing again. are backward stitches and are created either by knitting into the back of the stitch rather than the front, or by putting the yarn over the needle incorrectly. Think of a stitch on the needle as having two arms. The stitch's right arm is toward you and is called the front loop. The stitch's left arm is behind the needle and is called the back loop. On the next row when you come to the backward stitch, reverse it before continuing. Slip stitches — what they do? To slip a stitch means to move it from the left needle to the right one without working it. Slip the stitch as if to purl but with the yarn to the back (or point to point). Ordinarily, stitches are slipped every other row and worked on alternate rounds to even up the fabric. The slip stitch may be used to form a "false ribbing" or a fold line for hems and facings. When making some decreases, the stitch is slipped "as if to knit" or "knit-wise". S1 [Sl 1], K1, PSSO (slip one stitch, needle in front of the stitch, knit one stitch, then pass the slipped stitch over the knitted stitch). One of the most common errors is picking up an extra stitch at the end of the row when you knit into the loop of the stitch below. To avoid this, check the last stitch as it goes on the right needle. Also be sure the first stitch at the beginning of a row is snug so loops from the stitches below do not wrap around the needle creating what looks like two stitches. At the completion of a project, weaving in any yarn ends is necessary for neatness and to prolong wear. With the wrong side facing, thread a blunt-pointed needle with the end of the yarn. Carefully weave the needle along the back of the stitches about 2 to 3 inches on a diagonal, gently pulling the yarn end. Weave the other yarn end in the opposite direction. When finished, gently stretch the fabric in all directions so the fabric does not pull. Trim excess yarn ends. Yarn over — what does it do? A yarn over creates spaces or holes in a piece of work, forming a lacy effect, and adding an extra stitch. When working on the knit side of Stockinette Stitch hold the yarn at the back of the work. Pull the yarn forward between the two needles and over the right needle to the back of the work. Knit the next stitch. On a purl row, with the yarn at the front, bring yarn over the right needle to the back of the work, then bring it back forward again between the two needles. Purl the next stitch as usual. Remember to treat the yarn over as a stitch on the next row, creating the eyelet space. Many pattern directions usually include a decrease in the same row to offset the increase stitch. Extra stitches…where did they come from? Missing stitches…where did they go?